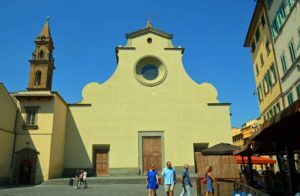 I arrive by taxi at the tour meeting point — Piazza Santo Spirito — early enough to enjoy exploring the neighborhood, do a little shopping, photograph nearby Palazzo Pitti and enjoy a Coca-Cola Light at Caffe Ricchi. 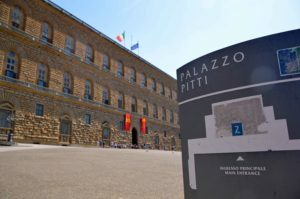 Palazzo Pitti is located south of the Arno River. At the appropriate time I head for the fountain in the middle of the piazza. Here I meet Gaia Ancilotti, a cheerful young woman, and a couple from New York who are also on the tour. 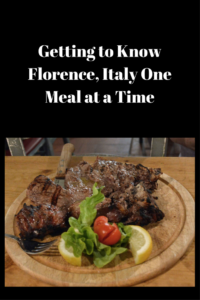 The “Sunset Food Tour” is new to Eating Italy. 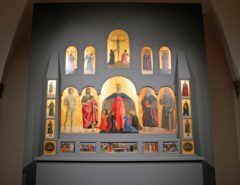 While “The Other Side of Florence” runs during the day in the neighborhood of Oltrano, the evening tour takes visitors through the neighborhood of Santo Spirito surrounding the piazza and the Church of Santo Spirito. Gaia, who lives in this neighborhood, explains we’ll be making six stops over the next three and a half hours as we walk along cobblestone streets and meet several locals along the way. Our first stop is at a small grocery store where we sample truffle cheese and Finocchiona salami. Gaia explains the difference between black truffles and white truffles, the season when they are hunted and that pigs are no longer used to find the truffles because they more often than not eat the truffles before the hunter can get to it. Today highly-trained dogs are used for the task. The specialty of the deli-like grocery store is cheese and cured meat. Next we head for a bar which Gaia explains is also open for meals including breakfast and is the center of the neighborhood. Although I am strictly a Coca-Cola Light drinker, I enjoy watching how Italian cocktails are made including Americano, Negroni and Negroni Spagliato. 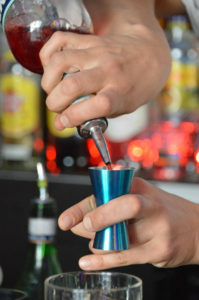 The bartender mixes different Italian cocktail specials. 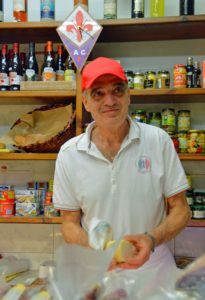 The “loose wine” shop, an Italian tradition, is next. Gaia explains much of the cost of wine is in the bottling. In a Vinaino, guests drink wine straight from the barrel. We also make a stop at a traditional wine shop before heading for I’ Raddi and the main course Bistecca alla Fiorentin. Here we are invited into the kitchen where we watch as the chef chops the steak from the side of beef. 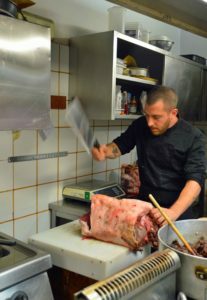 Soon the beautiful cut of meat is brought to the table along with cannellini beans. The chef chops the steak from the beef flank. 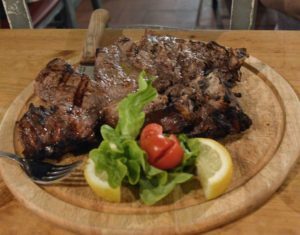 Juicy, tender steak is the main course. Of course what would a meal be without dessert? At the last stop we sample Cantucci, a biscotti made to dip in Vin Santo — a sweet wine. I enjoyed the food as much as the experience of visiting this historic neighborhood in this beautiful city. Saluti to a fantastic evening, wonderful food and great company! 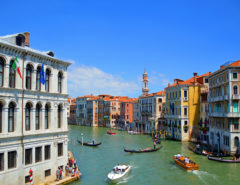 Disclosure: As is common in the travel industry, the writer was a guest of Eating Italy, but the excellent evening experience was all her own. Marilyn, I love your travels, posts and photos! You have traveled to exotic places and written for top publications. 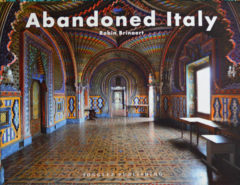 Your enthusiasm for travel writing seeps through each photo. Congratulations! Wow!! Thank you so much for your kind comment…I really appreciate it! It means a lot to me. I am so sorry your cousin would do such a foolish thing!! Thank you so much!! I really appreciate your kind comment!! Thank you so much! It was a great tour. I like this weblog very much, Its a rattling nice post to read and find information. “One man’s religion is another man’s belly laugh.” by Robert Anson Heinlein.